Bake up some warm holiday memories with your children this season. Put on those aprons, the mess is part of the fun! Older children can crack the eggs and measure wet/dry ingredients, while the younger children participate by pouring the pre-measured ingredients into the mixing bowl (be sure to point out that oil and water don’t mix) and by stirring and creating cut-outs with cookies cutters. Be sure to encourage creativity and imagination when it is time to decorate! Festively colored frostings, sparkly sanding sugars, pre-cut fondant in holiday shapes (or make your own), gumdrops and more are perfect for little fingers, and make for wonderful holiday cookie decorations. Don’t forget to taste test your creations! Giving and sharing provide a feeling of joy that you can reinforce by having your children deliver a plate of cookies to a neighbor or the local senior center. 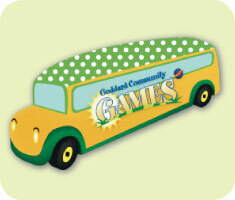 Hop on The Goddard Community Games Virtual Tour Bus! Commitment to our community is at the heart of The Goddard School. To unite our Goddard School community with our online community, we are bringing the Goddard Community Games Virtual Tour to you! ?On January 3, 2011, the Goddard Community Games Virtual Tour will begin its journey across the country via Facebook, Twitter and The Goddard School Blog, acting as a launch to our nationwide Goddard Community Games event on February 5*. All families are invited to join us on this exciting cross-country tour ?by sharing your favorite family-friendly activities and places to visit in your community (and why!) on Facebook (e.g., the best family-friendly restaurant, top no-cost activities and favorite educational landmarks).
? ?To provide your feedback, comment below or on our Facebook Page! Check the Virtual Tour Bus Schedule (from the Goddard Games tab within Facebook) – when the Virtual Tour Bus “arrives” in your area a compilation of all our families’ favorite activities in your community will be posted on Facebook for your vote! When sharing your favorite place in your community, be sure to let us know where you are located (city or state)! Let the Goddard Community Games begin! *At participating locations. Check with The Goddard School in your community for dates and times. Snuggle up with your little one and share in the adventures of a good book! Children of all ages will benefit from this quality time with you and their imaginations will soar with every turn of the page. Stick to simple board books with one picture per page and contrasting colors for the youngest readers (Infant to One Year). Make exaggerated faces to express emotion, change your voice, describe everything and point to the items on each page as you make your way through the book. Watch your child for clues as to what part of the book is his/her favorite. As children grow, so can their stories. Progressively move to longer books and allow your child to interact by pointing to items, turning the pages and even reading some themselves, if developmentally appropriate. Continue to make faces and change your voice for characters or make sounds for objects and animals. If they’re still learning to sound out words, help them along by annunciating sounds in a normal tone and prompting them to repeat after you. Together, you and your child can learn, laugh and create fond memories as you beat the winter blues, book after book. Some great winter books to check out: Biscuit’s Snowy Day by Alyssa Satin Capucilli, Welcome Winter by Jill Ackerman, Winter Friends by Carl R. Sams and Jean Stoick and Winter by Gerda Muller. Don’t let the chill in the air keep your children indoors and inactive this winter. Bundle up appropriately and get out and play! Check local Web sites and activity guides for places you can hike, ski, sled, ice skate or snowshoe. Romp in the snow and enjoy an exciting snowball fight. If it’s too cold to be outdoors, consider indoor activities such as swimming, karate and dance. Limit TV, video game and computer time to encourage your children to get active. Set a good example. If you’re telling your children to get out and play, make sure you do, too! Are you shopping for a preschool-aged child this holiday season? Look no further! Children and educators from select Goddard Schools – leaders in early childhood education – have announced their top toy picks for children ages two to six years old for the 2010 holiday shopping season. The Goddard School® Toy Test is the only national toy test designed exclusively for children in the preschool age range. The Goddard School is dedicated to providing an environment where teachers support the nurturing and learning children want and need. It is with this focus that Goddard Systems, Inc., named the number one childcare franchise company for the ninth year in a row by Entrepreneur magazine, has released its third annual list of top toy finalists. The Baby Stella Soft Doll collection has lifelike toes, belly buttons and plump tummies with a wide variety of adorable outfits and accessories. Baby Stella gives children the chance to learn how to nurture and care for their loveable dolls and valuables. Baby Stella Cute Comfort Car Seat provides a soft carrier for your child’s favorite Baby Stella doll. This fun accessory supplies your child with a new way to play and take care of their Baby Stella doll so he/she can go anywhere your child goes. CitiBlocs inspire open-ended play and creativity. Start low and wide, and then stack them high and narrow. Whatever your preference, the CitiBlocs 200 piece set will keep the enthusiastic builder flexing his or her imagination while developing fine motor skills. The Railroad Pals Building Set includes an idea sheet with 20+ building ideas to inspire creativity and a handy storage container for easy clean-up. Build fun train cars, engines, cabooses and more! The Dinosaur Zipbin’s dramatic exterior identifies the contents and will look great in your child’s room. When the bin is unzipped, it becomes a dinosaur island Playscape™! This activity mat is perfect for playing with dinosaurs, animals, vehicles, boats, action figures, etc. Fantasy play is encouraged by a prehistoric world featuring a volcano, a river, a tar pit and a mysterious cave. (Suggested Age Range: 3 & up) Neat Oh, International! Just add water to unleash the Slimy Squishy Polymer Fun in this set today. Hydrate Silly Squares and try to stack and build with them, watch your Slipper Spheres grow over 100 times their size in a matter of hours! Throw them, roll them, bounce them and watch their colors blend. Make your own multicolored slime however you like it, thick or thin, chunky or smooth! Grow your own multicolored miniature icebergs with JellyStones. Mix the polymers together and make your own creation! To learn more about The Goddard School, families are encouraged to visit www.goddardschool.com or call 1-800-GODDARD. Though we’ve heard that breakfast is the most important meal of the day—especially for children—it is often a casualty of morning mayhem. Start your child’s day off with a nutritious and energy-boosting breakfast. Children (grown-ups too!) who consistently eat balanced breakfasts have more energy, better diets, perform better and are less likely to be anxious or irritable. We’re busy with our daily routines and sometimes it seems difficult to find healthy foods that children enjoy. Serving up a balanced breakfast is actually easier than it seems! Trying these nutritious breakfast tips and easy ideas can help make mornings cheerier, keep tummies fuller and help provide lots of energy. Cutting foods into fun shapes with seasonal, animal or other cookie cutters is a quick way to turn a boring breakfast into a tummy pleaser. Turn an ordinary bowl of whole grain cereal with milk into something more exciting by topping with sliced star fruit, pomegranate seeds or other unexpected bright fruit. Scramble egg whites with low-fat cheese and diced, colorful veggies. Add tomatoes for eyes, a baby carrot for a nose, a slice of turkey bacon for the mouth—even broccoli for hair! Whip up a mixed fruit smoothie using crushed ice, yogurt, fresh or canned fruit and add brightly colored frozen juice concentrate. Garnish with an orange wedge. This can be made the night before to save time in the morning. Toast a whole grain toaster waffle, top with low-fat berry cream cheese. Create a flower or other fun design on top using sliced strawberries and peaches. Spread peanut butter in a whole wheat tortilla. Add raisins and banana slices, roll up tightly and slice to create yummy pinwheels. Create a ‘breakfast pizza’ using a whole wheat English muffin. Spread the English muffin with low-fat flavored cream cheese and top with diced fruits or veggies. Your toddler shows all the signs that he is exhausted and in dire need of a good old-fashioned nap. He is yawning, whining, rubbing his heavy eyelids and twirling his hair—but, at the mere mention of a nap, he just may melt down. The explanation is truly a simple one: Toddlers do not want to miss out on even one moment of adventure, as they are beginning to understand that they can assert their own independence as often as they like to manipulate the world around them. Plan a quieter activity before nap time begins to allow for a winding down period. Make the transition to nap time consistent each day: potty time, read a book, cuddle up with a lovey or special blanket. Never make nap time a punishment. Make sure naps are in his bed or crib. This will help him associate his own bed with sleep. If he absolutely refuses to nap, leave him with some toys and books and tell him it’s quiet time. Give him a hug and a kiss, tuck him in and leave the room. Remember, sleep is very important for a growing child. If your child repeatedly gets up after you have tucked him in, calmly take his hand and return him to his bed. Walk him back to bed each time, and he will soon realize that you are serious. If he still seems to have difficulty napping, let him know it’s ok to stay awake, but he needs to use this time as “quiet time.” Be calm—but firm—about this resting period. Children (and parents, too!) need rest, even if they are not sleeping.